Paul begins his letter to the church in Rome by giving them an overview of his situation. He shares three characteristics about himself, his mission, and his calling. Though he does this to establish credibility for his message, and thereby encourage the recipients to take his words seriously, the attributes seem like a mini-biography, one with spiritual importance. A Servant of Jesus: I like to call myself a follower of Jesus—as opposed to the more general description of Christian, which means different things to different people. Being a follower of Jesus shows commitment, yet it still implies I have some say in the matter, that I made a choice. Being a servant, however, carries with it a deeper commitment. I need to move my mindset from being a follower to becoming a servant. Maybe you do, too. Called to be an Apostle: Instead of focusing on the meaning of the word apostle, which could suggest a missionary, a church leader, or a passionate adherent (all of which describe Paul), let’s instead focus on the word called. What does it mean to be called by God? Set Apart for the Gospel: While being set apart could be a Spirit-led summoning of the highest order (Acts 13:2), it could also be a simple command to set ourselves apart from the world, to not be conformed to it (Romans 12:2). Everyone who follows Jesus should be set apart in this way, while being open for him to also set us apart for something greater. 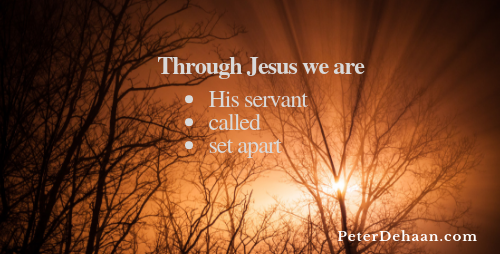 If we are a true Christian (as opposed to being one in name only), we will do well to adopt the attitude of Paul: that through Jesus we are his servant, called, and set apart.